I know, it sounds gross. But those aren’t the type of leftovers I’m talking about. I am talking about using those leftover bits of raw fruits and vegetables. You know, that half of a banana your little one didn’t eat at lunch, or the three pea pods he neglected. The chopped vegetables, such as carrots, cauliflower, celery, and broccoli, from the get-together you had the other day. It’s also okay to use that hard-boiled egg no one wanted at breakfast, and the last of the fresh parsley or thyme. Go head. Use stuff up. Doing so will save money on your grocery bill, and add necessary nutrients to a smoothie that your body will love you for. And you wont even notice the taste of those foods, unless they are being used as the main ingredient. You’ll notice that I implement this tactic often in the smoothies I make. I love melons and berries, and find combining the two makes for some tasty recipes. These combinations are great for spring and summer. This recipe makes a great side dish to any meal, but will also make a delicious snack or dessert. Rinse the blueberries well. Lay them out one towel and pat dry with a towel. Place the watermelon and blueberries in a salad bowl, and top with coconut cream. To save money, use fresh produce from your own garden. Serve with a barbecued meal of chicken, squash, and sweet potato. I love parfaits during the spring and summer months. This berry based parfait is easy to make for a quick snack any time, and a little dark chocolate can be added if it is to be consumed as a dessert. Rinse the berries well, and lay them out on a towel to dry for a few minutes. Slice the strawberries, disposing of the tops. Layer the ingredients like so: Coconut cream, blueberries, strawberry slices. Do this, being sure the top layer is of coconut cream when done. Sprinkle Paleo granola over the top, and some dark chocolate chips if desired. To save money, grow your own berries. Try other berries when in season. Serve with a vegetable-based salad on a warm day. What are mix-ups? Well, to make a mix-up, all you do slice or chop fruits and/or vegetables for freezing. These will likely be different each time you freeze, depending on the available produce and the amounts. They are easy to throw together and place in the freezer for later use. This is a good way to use up produce that may be a little less than fresh, and to use those odd pieces not used in recipes or eaten with meals. Take out a large mixing bowl, and a cooking spoon for mixing. Get out your cutting board and a sharp knife. Take the vegetables you are worrying about going to waste out of your refrigerator. Produce that may not be the freshest, but could be used in a stew or something else. Look at the counter produce to see if any of it needs to be used. Rinse everything and wipe dry with a towel. 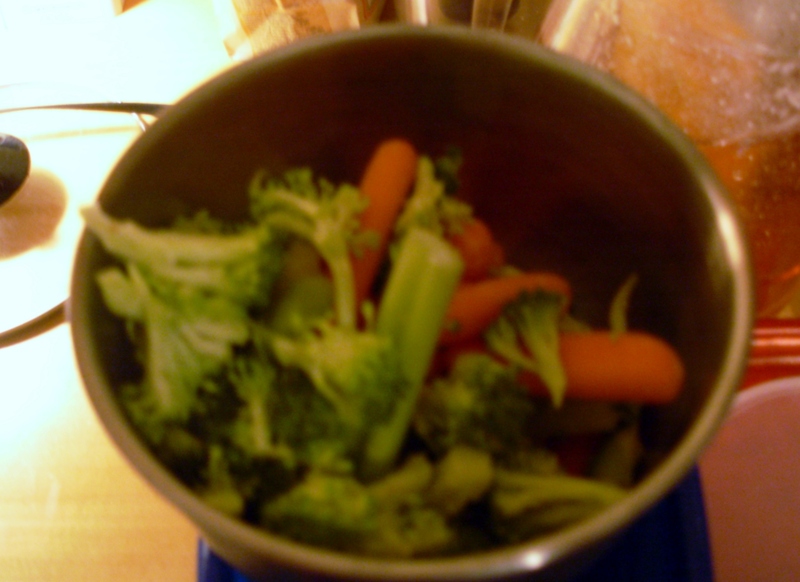 Chop all the vegetables and throw them into the bowl. Throw out the trash (or compost it! ), and then mix up what is in the bowl. Spoon the vegetables into the container(s), cover, and freeze. To make fruit mix-ups, take the same steps above and use the fruit mix-ups for smoothies or homemade ice cream. These are great ways to help you save money. 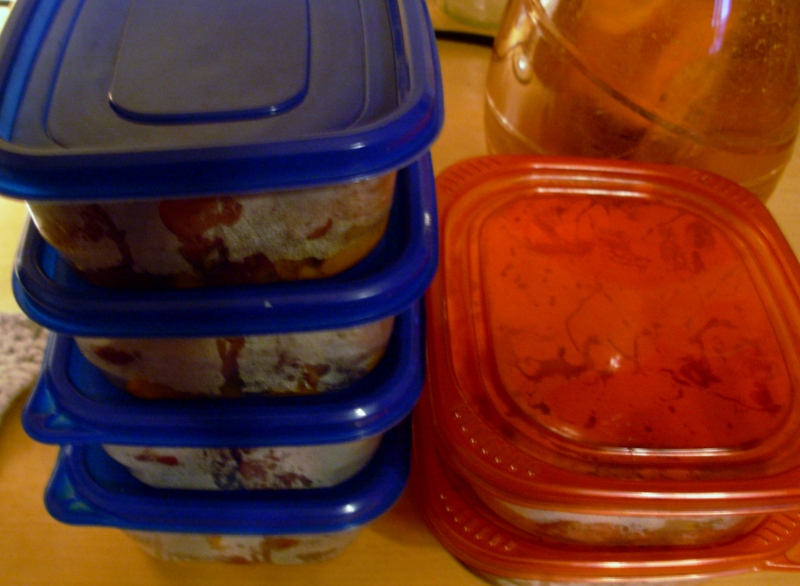 It is frugal to also use leftovers in the same manner, adding even as little as a teaspoon of corn or pees to a freezer mix-up will allow you to save money in the long run. How do you save money in the kitchen? 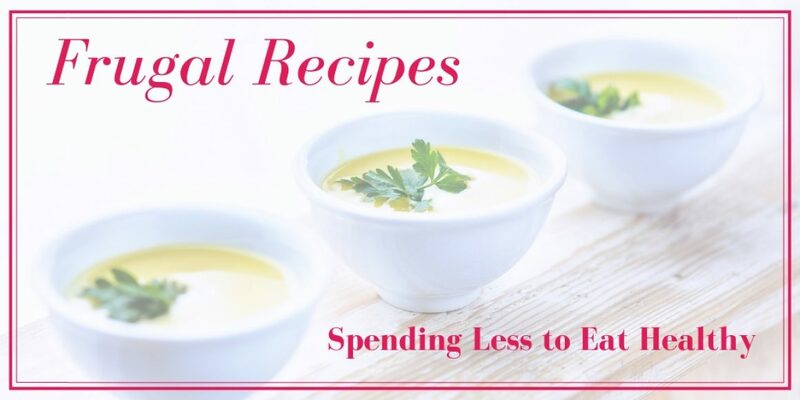 Get a copy of my eBook Frugal Ways to Save Money in the Kitchen + Frugal Recipes for the Health Conscious. It is FREE! I love September because it’s the month I start having huge baking days each year. I had one such day on the 9th. Mind you, it was still quite warm, and I rent a room so it heats up quickly. At this point, the AC is used to keep the temperature regulated on baking days. Soon, it will not be necessary. This is what I ended up with at the end of my baking day. Quite a bit, and well worth my time. 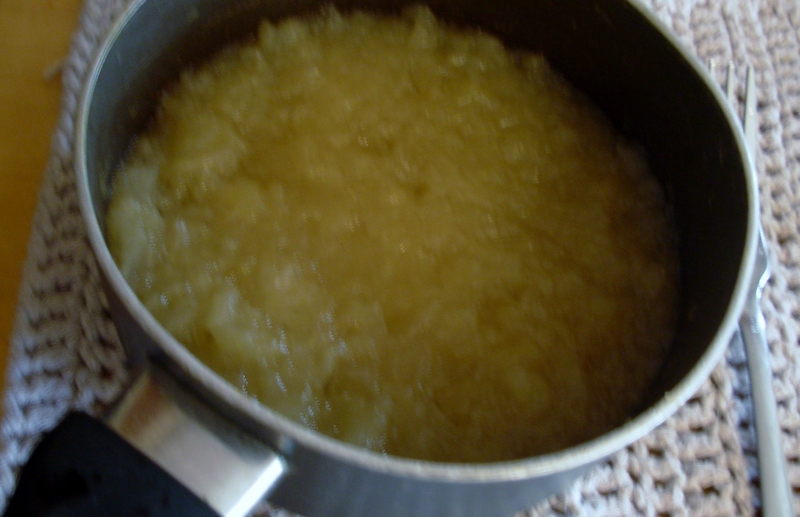 I made applesauce in one of the slow cookers, using the red delicious apples I had left from the previous week. All I did was core and peel them, slice ’em up, and layer them in the crock. I covered the slices with water, filling to just above the tops of the apples, then cooked on high for 3 hours. I ended up with enough applesauce to go with 4 meals. At no added cost for the week because the apples were left over. 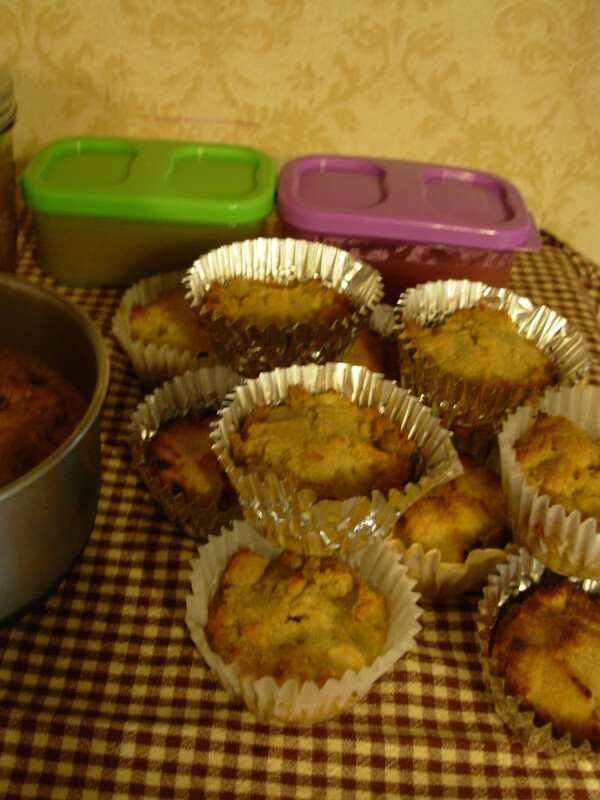 Then I started the Paleo Cornbread Muffins (Empowered Sustenance). Again, these are not the same as regular cornbread but turned out well. This recipe made a dozen. And I wanted to have a breakfast on hand that would be quick and easy to put together each morning, so I made some Paleo Pumpkin Pancake batter (Paleo Newbie) and put it in the refrigerator to be cooked up as I wanted, at a rate of 1 pancake per day to go with a smoothie. My budget for groceries was only $3.00 for the week. A lean week indeed. I bought a package of hot dogs for $.70, a 3-pack of string cheese for $1.00, and a can of peas for $.69. Everything else I already had on hand, except some cucumbers, kohlrabi, a tomato, and zucchini from Mom’s and Lloyd’s garden. 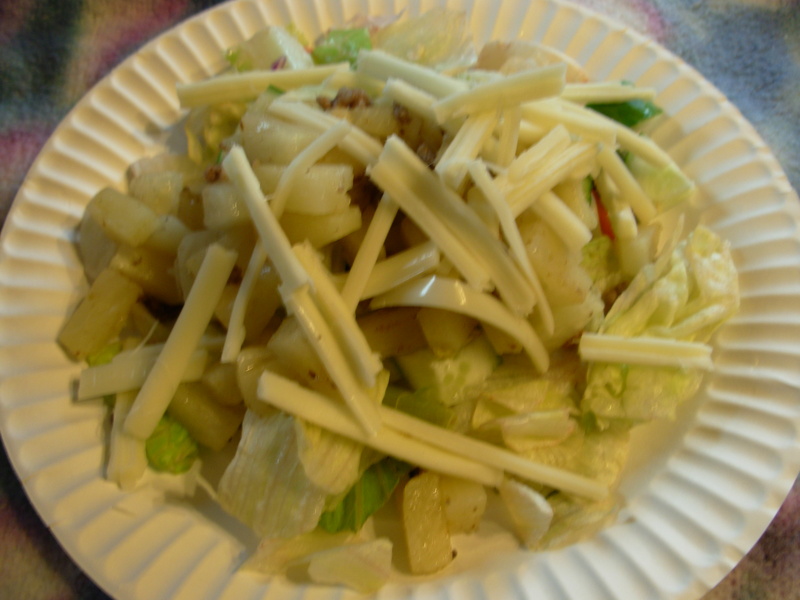 Lunch was a simple, leftover mixed salad. I topped it with some string cheese. It was a refreshing, light lunch. And this was dinner. 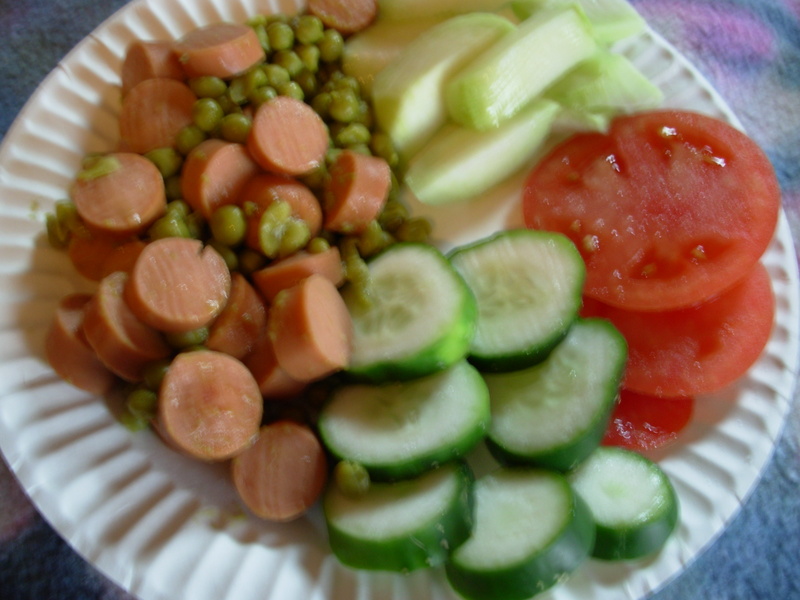 I cooked the hot dogs and peas in a fry pan, and served it with fresh cucumber, tomato, and kohlrabi. This made a few meals. It was a pretty good meal, despite the hot dogs. A couple of days earlier I’d made Chocolate-Coconut No-Bakes (Here on the blog.) and Easy Slow Cooker Taco Meat (Rubies & Radishes). Both recipes were absolutely delicious, and helped me get through the coming week. 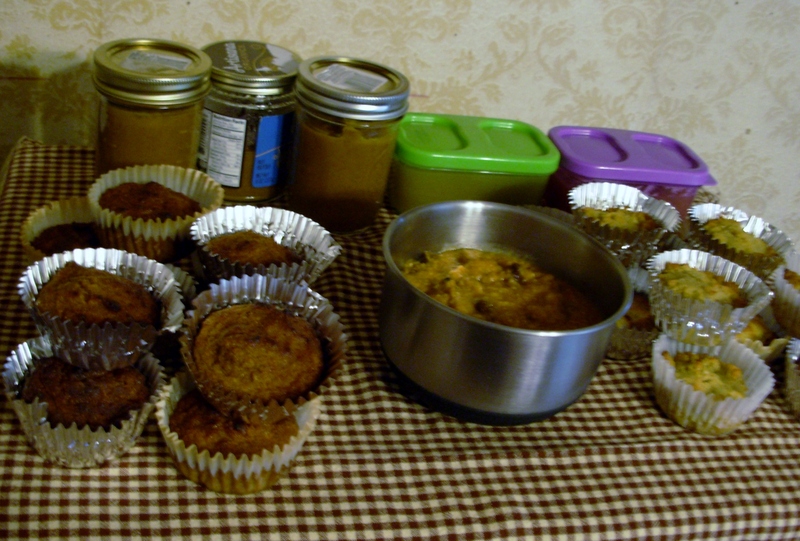 With all the fresh produce from the garden, there was plenty of food to last. This was one of my meals later in the week. 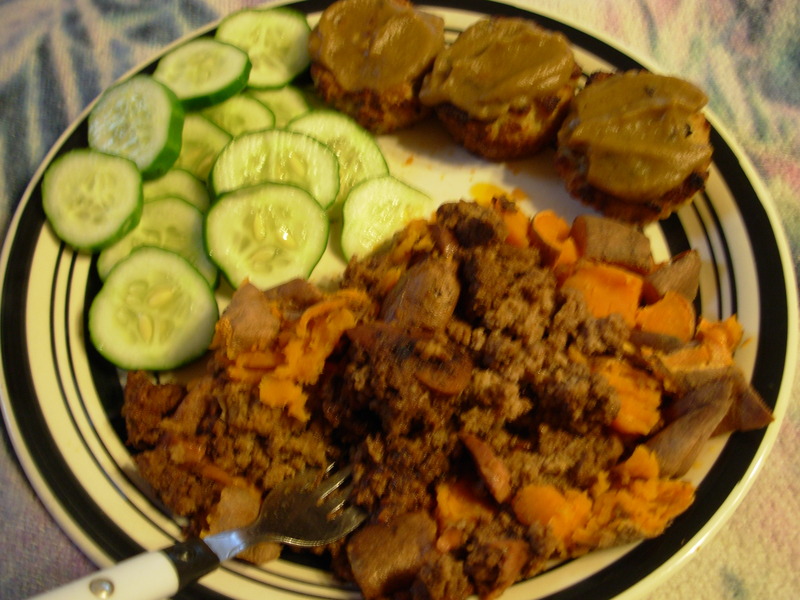 Sweet potato topped with leftover taco meat, cucumbers from the garden, and the Paleo cornbread topped with the homemade pumpkin butter. It was a delicious meal. What are you cooking up this month? Let us know in the comments, or email me at shannonlbuck@gmail.com. I always reply to comments and emails. If you read Try This to Save Money on Groceries and A New Way to Plan Meals, you know I was planning an experiment. I meant to do this before now, but the temperatures have been too low for me to walk from Walmart to work. Ordinarily I do the shopping then walk to work, placing my food in the refrigerator until my shift is over. However, I’ve not been able to shop regularly because my asthma kicks in at drastically low temperatures. This weekend has been marvelous! And I decided today was the day to shop. Ordinarily I plan my menu before I go to the store, shop sales, and use coupons (trying to use sales with coupons when I can!) and keep it all very organized. Today I decided to do things a little differently. I did not plan a menu, except to know that I wanted lemons and limes so I could make some lemon-limeade this week. I also needed some almond milk. Keep in mind, I usually have most of the above items on hand before a grocery shopping trip. During a good shopping trip, where I buy quite a bit, it would not be uncommon for me to spend between $60.00 and $65.00. Just for me. And that is (mostly) good-for-you stuff, with just a few items that are processed and not real good for you to lessen costs a little. I did not want to spend that much, and I wanted to test out my theory that one can save money without planning for a shopping trip, while buying many of the less expensive things and still getting enough healthy food to feed oneself for the week. 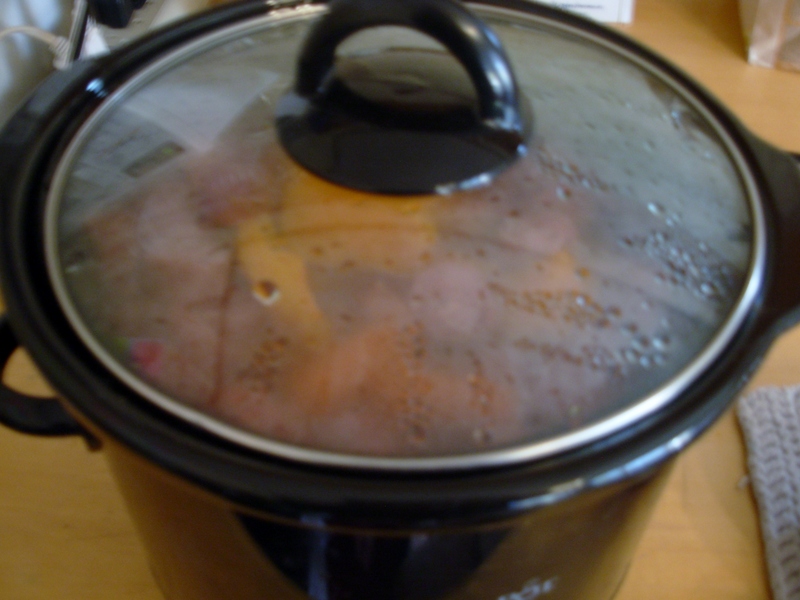 I can get quite a few meals out of the stew meat, red potatoes, and sweet potatoes, when using them with the carrots and squash I have on hand. The spinach and arugula will mainly be used in smoothies, but I might also make a couple of meals where I serve them with eggs and sausage. This will allow me to stretch the sausage to two meals, and be plenty filling. I may also make some homemade applesauce. I was so happy they had lemons and limes. They didn’t the last time I was in there. I was surprised at how good the strawberries looked, and could not resist the price. Organic is expensive, and I cannot afford to get everything this way. So I do what I can, with what is available. I hear apples are one of the worst fruits to buy non-organic, so I’m trying to be good with that. The same with the spinach. I do know the Clean 15 and the Dirty Dozen, but Walmart in my area does not always have organic options for everything, and I couldn’t afford to get all organic anyway. I truly wish I could afford grass-fed, etc., meats, but they are just not in my budget. The trays of organic vegetables did not look all that fresh this week, so I went with the non organic tray. Notice how I did not use coupons, and only a couple of items were on sale, yet I still came in at less. I’ll have to deal with what I have on hand now that the shopping trip is over, but I don’t think that will be a problem. Between my groceries and what I already had on hand, I am pretty well set. Tomorrow is my day off, and I’ll spend it making meals for the week. I will better know afterward how many meals I have for the coming week. Another workweek. Another food prep day. Do I mind spending an entire day each week cooking? Absolutely not! I love to cook. And I have less to do on a day-to-day basis when I do this. I started with a slow cooker meal. This week I made an Autumn Sausage Slow Cooker Meal that came out real well. I love slow cooker meals. They’re so easy to put together, and free up plenty of time for preparing other foods and getting my cleaning done. Then I also have time for writing. The squash I used in this recipe was a freebie from my parents garden. And the cost before taxes for the sausage was $3.75. Take a look at the store’s selection. You may find a more affordable sausage option than what you use already. I did. 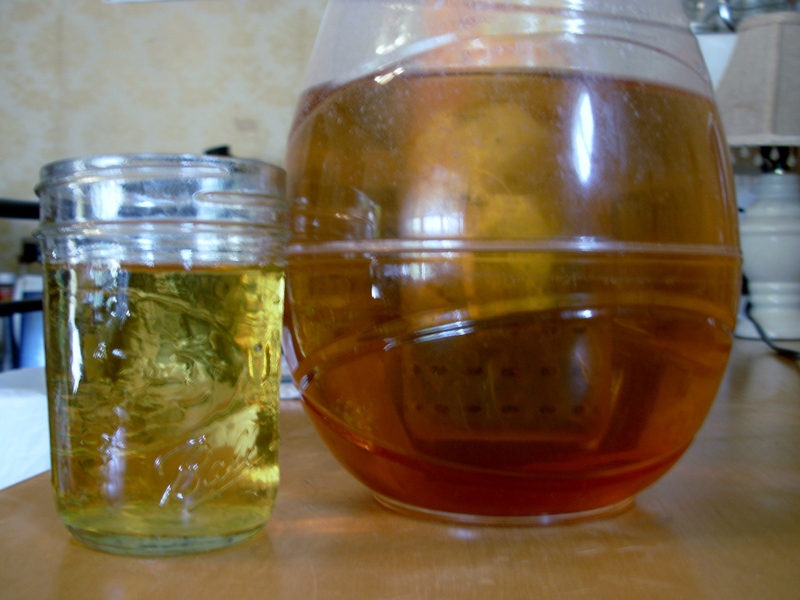 I then made the base for my iced tea for the week, Berry-Orange Iced Tea. In a few days I will change the tea bags and replace the old orange slices with new. I just keep refilling the pitcher with water during the week. The tea bags were left over from last winter. The fruit was left over from last week. So I did not pay any more to make this. Next I made more Chunky Applesauce. This is such a simple recipe. I cook the apples down in water. I don’t add anything else when cooking. When I’m ready to eat the sauce, I add some organic cinnamon. Organic tastes so much better than the stuff I used to buy. The apples were also leftover from last week, so this is essentially another freebie. Photograph by Shannon L. Buck copyright 2014. And I put together 6 Vegetable Jars. 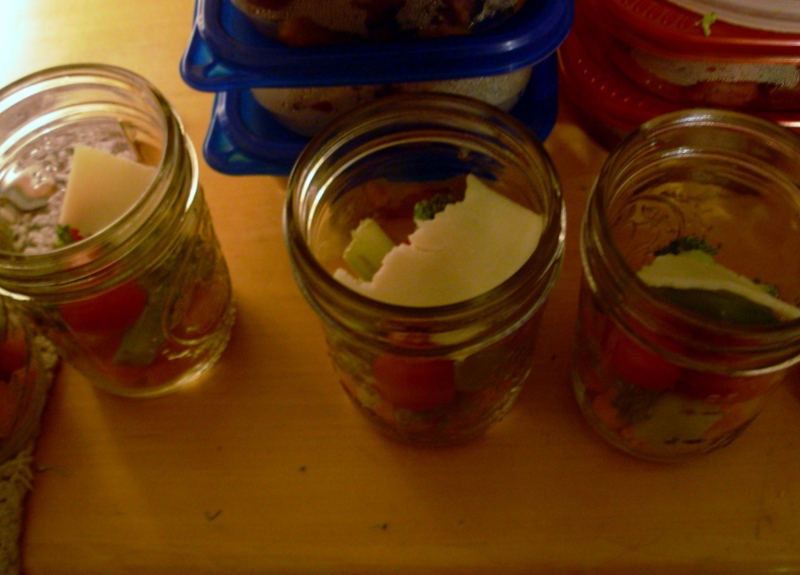 This weeks jars consist of carrots, celery, broccoli, sugar snap peas, cherry tomatoes, and a bit of cheese. The carrots were left over from last week. As was the slice of cheese that I broke into 6 pieces. Plus I had leftover vegetables to have with other meals or as snacks. After using up all the sandwich meat that comes in the covered containers, I reuse the containers for packing my lunches. I split the food between the containers. I know it does not look like much, but I bring other foods as well. This all made 6 meals, and I have a few snacks. Not too bad. 6 proportioned out slow cooker meals. A jar of pickled beets. 2 bottles of water. Free from a guest at work. (She actually gave me 8 bottles.) I’ll drink tea at work when I don’t have the water (also free), or the iced tea I made is for when I’m at home. 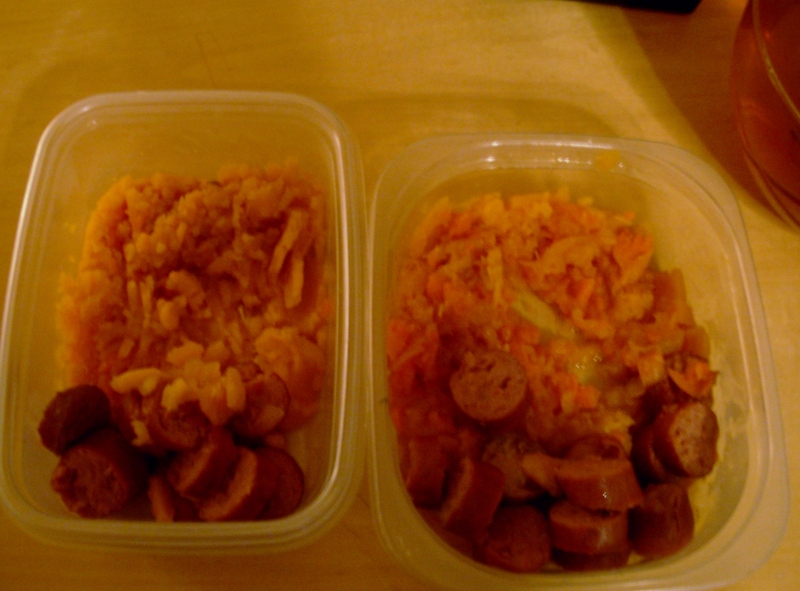 That is 6 meals and, because my work schedule changed this week, I only need two of them for work. I put three slow cooker meal portions into the freezer. They will be good on my days off. Fruit jars are so easy to make. Start by rinsing off the fruit, and patting them dry with a clean cloth. Then prepare the fruit by cutting, sectioning, and whatnot. Make sure the canning jars are clean and dry. Grapes, strawberry slices, and raspberries. Grapefruit sections, orange sections, and halved grapes. Kiwi, halved grapes, and raspberries. 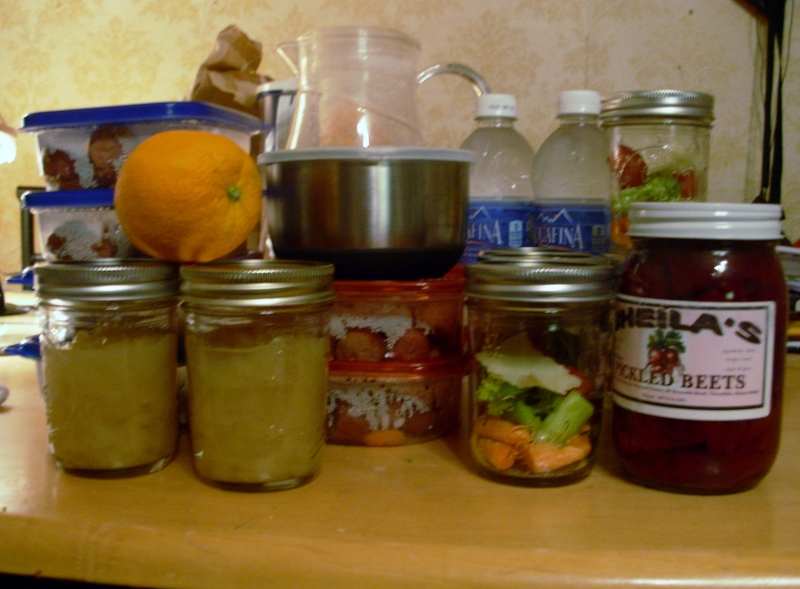 Fruit jars will last at least 3 days in the refrigerator. These make a great component to any meal, or can be used as a snack, and are easily placed into a lunch sack. A simple treat that can be used as a side to any meal, or a snack, or even as a dessert. And, they are great when served at Patriotic holiday tables. Small children can help with this one as well, if you cut the grapes yourself. Keep these in the refrigerator until they are ready to serve. The measurements will depend on how many you need to make. Rinse the fruit. Dry carefully with a clean towel. Combine the coconut cream and 1+ tsp pure vanilla in a bowl, and whisk or beat a couple of minutes to blend well. Place some blueberries into the bottom of each sundae cup, and a dollop of cream, then add grapes. Add another dollop of cream to the top, and a few more blueberries. Rather than using grapes, try red apple slices, raspberries, or strawberries. Whatever will allow you to save a little money. Drizzle the top with an easy syrup: Raspberries or strawberries, boiled in water to make a syrup. Do not add sweetener. Serve at breakfast with pancakes and sausage.